Insurance is of the utmost important for you, your horse and your hauler when considering horse transport!! You should not consider any equine transport company that is not properly insured. In Canada, if you are hauling a horse and exchanging any funds to do so, you are considered a Commercial Hauler. We are required to carry and adhere to the regulations of the National Safety Code. We abide to the standards of NSC. As well, have taken the necessary steps to be registered as a Professional Equine Transport company. In the US, there are alot of regulations and rules for horse transport between Canada and the U.S. The primary of which is to carry a U.S. Department of Transport number. Our USDOT is displayed on our truck. 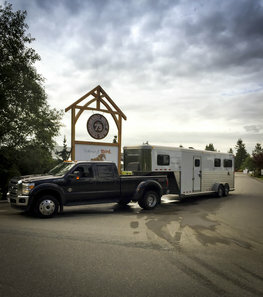 We also have a Commercial Hauling account with Pacific Customs Brokers, who handle all of our paperwork for transporting horses in and out of the US and Canada. In addition to these two licenses, we also have additional insurance with Capri Insurance. Each horse while in our care (including while on the trailer and overnight boarding) is covered up to $100,000. It is important to note, that the coverage is if something were to happen due to our fault. We recommend that our clients also carry insurance for their horses. Haulers that only insure through HCBC are not providing enough insurance for Commercial Equine Hauling. The Cimarron 3+1 horse trailer. 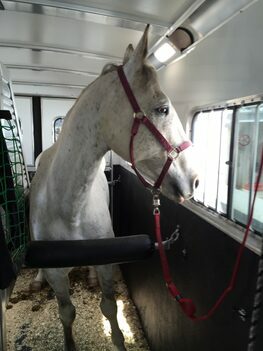 It is a tall warmblood sized trailer. The two standing stalls in the back are 10ft. in length by 3 1/2ft. in width. We have hauled a 19hh Belgian comfortably. The box stall can be converted into two standing stalls. The box stall open is large enough to carry a mare and foal...or as we have experienced a little herd of Mini Yearlings! The two standing stalls can also be opened to provided a 8ft.x10ft. large box stall. 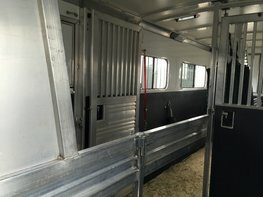 Insulated for a quiet and comfortable ride, the trailer stays relatively cool in the summer and maintains warmth from the horses in the winter. We pride ourselves on cleanliness both inside and out. After each trip, the horse trailer is completely gutted. It is cleaned inside and out, as well as disinfected. One of the bonus features that we appreciate the most is being access each stall. This provides the ability to load and unload without moving any horse and to check on the horses individually. Our trailer is also outfitted with a video camera. This gives the driver the security of being able to monitor the horses while on route. Big enough to carry any size horse, but small enough to provide clients with door to door service! Personal and Professional Horse Transport.